Monday, 13. May 2013 LANXESS’ Rhein Chemie business unit has opened a new production facility at the Porto Feliz site in Brazil. There, Rhein Chemie produces Rhenoshape high-performance curing bladders, which are used in tire manufacture. Porto Feliz, Mannheim, May 13, 2013 – LANXESS’ Rhein Chemie business unit has opened a new production facility at the Porto Feliz site in Brazil. There, Rhein Chemie produces Rhenoshape high-performance curing bladders, which are used in tire manufacture. Around 170,000 bladders can be produced annually in the new facility. The new plant is equiped with state-of-the-art production technology. The latest findings in bladder technology have been implemented. Rhein Chemie has been successfully producing Rhenogran polymer-bound rubber additives (Rhenogran) in Porto Feliz for more than 10 years now. An expansion adding advanced equipment for manufacturing polymer-bound rubber additives will follow in the coming year. The project represents an investment of roughly EUR 10 million and will create up to 60 new jobs in Porto Feliz. More and more tire manufacturers are outsourcing bladder production because it is more cost-effective for them to concentrate on their core business. As a specialist with experience and innovative strength, Rhein Chemie is focusing on manufacturing bladders and is consistently working to achieve new breakthroughs in bladder technology. This ensures the bladders deliver a corresponding level of quality and performance. For instance, Rhenoshape bladders have a much longer service life due in part to their high level of uniformity. 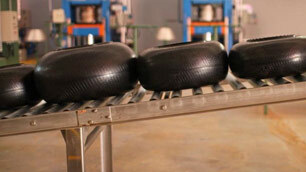 In other words, depending on the tire factory and type of tire, they can produce up to three times more tires. In addition to possible better productivity, the greatly improved thermal conductivity of the bladder compound and other factors boost the quality of the tire, thus increasing safety and reducing rolling resistance – and fuel consumption! Rhein Chemie entered the bladder market less than two and a half years ago with the acquisition of the Argentinian company Darmex. The company has already successfully expanded its bladder production capacity in Argentina. The purchase of US company Tire Curing Bladders last year added special bladder sizes as those used for the tires of trucks and earthmovers as well as bladders for tire building machines (Rhenobuild) to the portfolio. “Rhein Chemie is now the largest independent bladder manufacturer in the world. We also provide our customers with the added convenience of one-stop shopping, as we are able to supply release agents, bladder coatings and tire tread marking inks from a single source. And when we look forward at the prospects for our markets in the years to come, we are very optimistic indeed,” added Dr. Borkowsky.